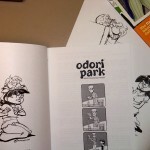 The first Odori Park–a 24-page 24-hour comic! Artist Editions are also available, which feature hand drawn original artwork by yours truly, and can be made out to you or whomever you may want to give a really awesome* gift. Go preorder a book! Yoroshiku onegai shimasu! Late last week I received word from the printer that the first copies of Odori Park: East Marries West will be shipping to me on the 17th! If you’ve preordered a copy (and it’s not too late, you know), I should be able to ship it out to you before the end of the month. If you voted for Odori Park in round two of Kurt Sasso’s competition, thank you for your efforts! I ultimately lost to the esteemed Alex Heberling (check out her comic, Alex’s Guide), but not before votes dragged OP up past her mountain of supporters, only to be cast down in a 30-vote tumble on the last day. Threats were issued, troops were rallied, and in the end, my grand consolation prize was learning what a fantastic and devoted group of readers I have! (Special mention goes to Natasha, who set an hourly alarm to remind herself to vote. Wow!) Thank you, everyone! Friday’s installment of “The Proposal” went up late, past the time most decent folk were in bed. If today’s comic seems to be missing something, go back and read Friday’s episode to fill in the gap. 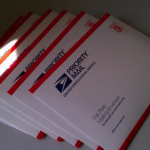 If you preordered a copy of the first Odori Park book, Odori Park: East Marries West, then you may be happy to know the first preorders–the regular editions–are in the mail, on their way to you now! Artist Editions will be shipping this weekend. If you preordered an Artist Edition copy of Odori Park: East Marries West, then know that your book is going in the mail today–so be on the lookout! 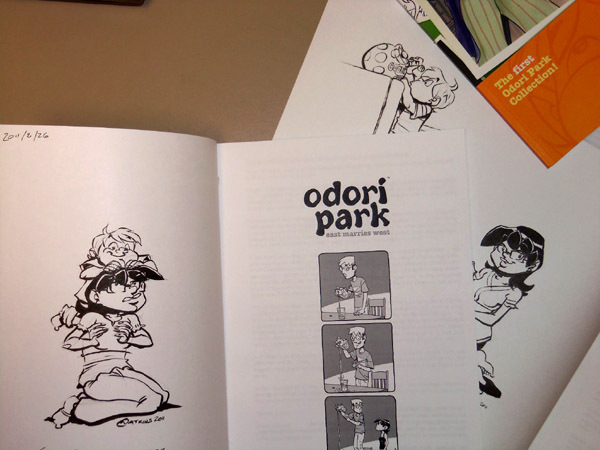 If you live in the western New York area, there are now two good ol’ fashioned comic book shops you can visit to pick up a copy of Odori Park: East Marries West. The first collection of Odori Park strips is now on sale at Park Avenue Comics & Games, in Rochester (713 Park Ave., Rochester, NY, www.parkavenuecomics.com), and at Pulp Nouveau Comix in Canandaigua (92 South Main St., Canandaigua, NY, www.pulpnouveau.com). If you’re in the neighborhood, please visit either of these fine establishments, where you can buy my book and completely avoid those pesky shipping fees. Of course, if you’re not a local (or if you have a special love for shipping fees), you can always buy a copy through my online store. Please do either, or both, and enjoy! 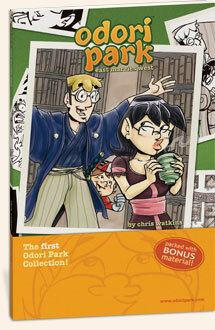 So, over the summer, you may or may now know, I released this book… Odori Park: East Marries West is a collection of the first year of OP comic strips, plus gobs of additional material, including a flattering forward by Brock Heasley of SuperFogeys fame, artwork from around the Web, dips into my sketchbook, and a 24-hour comic that was a spiritual predecessor to the Odori Park of today. Being that drawing gratuitous Halloween pictures is one of my favorite things to do this time of year, and that selling books is also something I love, I figured I’d mash the two together. With every book (regular edition or artist edition, either flavor) I sell through the end of October, I’ll include a free spooky sketch card, featuring some sort of ghoul or goblin, likely mutated from one of the characters in Odori Park. If you’d like a surprising bit of spirited artwork along with a copy of what I think is fair to call the year’s funniest comic strip collection about a Japanese-American couple, now’s the time to order! Just shuffle over to the Store page! And fang you very munch! So, yesterday, Trevor over at TakaComics.com tweeted that he had me on a list of intended fan-art recipients. 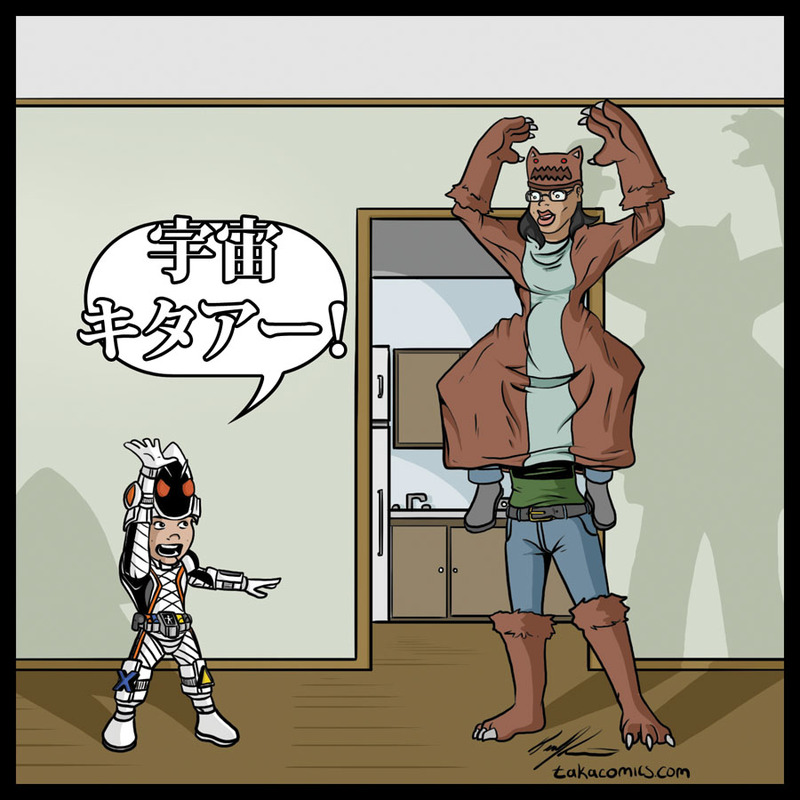 That, alone, was pretty cool, but then, today, I log in to find a piece of awesome Halloween-spirited artwork, featuring the whole Easton clan in Japanese monster costumes! (Click the thumbnail image to take a closer look.) 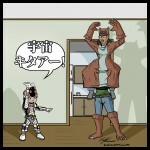 Make sure you check out TakaComics.com for Trevor’s Power Ranger/Super Sentai -inspired adventure comic, Kyoudaikido Soldier Chromacorps. Trevor, this is the bee’s knees! Thank you! While I’m on the topic of Halloween treats, I thought I should mention that there are only a few days left to take advantage of my October book offer. To recap: Order a copy of Odori Park: East Marries West before November 1st, and I’ll throw in a hand-drawn sketch card featuring an original illustration of someone from the Odori Park-iverse engaged in Halloween revelry. You can order straight from the Store page. I’m looking forward to sending out some more of these spooky sketches before the month is over!